The scouts are coming along, so I wanted to show you a quick update. 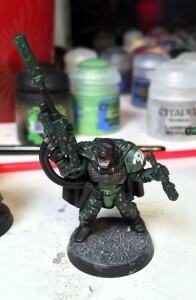 I’ve got the armor painted green and the decals on, but only the dude with his camo cloak up and the sergeant needed them, since the others have their pauldrons covered up. I added the decals right after the bisect of green, so they’d get weathered a little more convincingly. Annoyingly, this meant I had to wait on the green armor because of the method I use for decals. I do gloss coat first, then the decal itself with Microset, then several runs of Microsol, then airbrush on another layer of gloss coat across the entire model to protect it. After that, I airbrushed a 4 to 1 mix of Lahmian Medium and ‘Ard Coat to get a semi-satin finish, and THEN I could continue the green armor with a wash and highlights. It put a kink in my painting mojo, as I had to give the decals a day or two, occasionally hitting them with Microsol, and then eventually break out the airbrush. I finally painted the red lenses, and this is the first time I did them in two different ‘states.’ The brighter red is for activated lenses, just like my other marines and vehicles. You can see it on 3 of the sniper rifles that are aiming, the one scout with the goggles on his eyes, and the one with the ‘devo’ glasses with the little lens off to the side. The other state is deactivated, and that’s the old-school crystal look I used to do for marine eyes. Click the pic to zoom in, but here’s the basic recipe. Simple. You’ll also notice I painted the faces using my ‘young’ recipe, except the sergeant who got the paler flesh I use on my normal marines. The young skin is almost the same as normal, but I alter it a bit to reflect the heavier pigmentation they would retain at this age. I used dark gray pigment powder to represent face paint across the eyes. On my other scouts, painted using my old recipes, I simply used thinned black paint but I think it’s way too stark. I thought of this new method more like smearing ash across their eyes, just using their fingers. The scouts actually all had black eyes, but after the pigment you can’t even tell and I think this is perfect. When I first conceived of the line across the eyes, I did it to recall both the classic scout art from the Space Crusade era and also the face paint style of many South American native traditions. I still like that look, but I think this is something more practical, as it realistically masks the stark contrast between their pale flesh and pitch-black eyes. Seems like something they would do in the field, on mission. I’ve always liked the art that showed scouts with camo on their faces, but I think it loses some drama on the tabletop. This is a nice nod to all those references, but in a much more believable way. I also picked out just a few details in Leadbelcher to break up some of the black, but I wanted to keep it very minimal. I added some patina to the bronze and then overbrushed a little of the Warplock Bronze on again. I haven’t yet added the highlight, though. I just need to highlight the black, paint the rims of the bases and then add ash flock and a bit of weathering powders to their feet/bottom of the cloaks and I think they’re good to go. Comments? Questions? Suggestions? Hit me up below.